NEW!! THE SUPER HELICAL DIPOLE ANTENNA NEW!! <?xml:namespace prefix = align /> The new Super Helical Dipole Antenna works with almost any radio in almost any situation! Sony, Realistic, Sangean, Drake, or Grundig on the SW bands, or Icom , Kenwood or Yaesu on the ham bands. It really doesn't matter, because all these great brands of radios work equally well with the Super Helical Dipole Antenna. The Super Helical All Band Dipole Antenna provides users with a practical antenna that performs! It uses a simple but proven design that allows users to have almost full size performance in a smaller footprint! Even if you live in an apartment, or and can't put up a permanent outside antenna to surf the airwaves, the Super Helical Dipole Antenna will improve your reception. Even if you are a cliff dweller but can't afford their prices, the Super Helical All Band Dipole is a perfect answer. It allows you operate in limited space or travel situations, too! Ham radio operators have used the Helical design antenna for years in various configurations when limited space has been a consideration. This design has been adapted to by an experienced Ham radio operator, who has over 42 years of antenna building experience and a FCC Amateur Extra Class License. 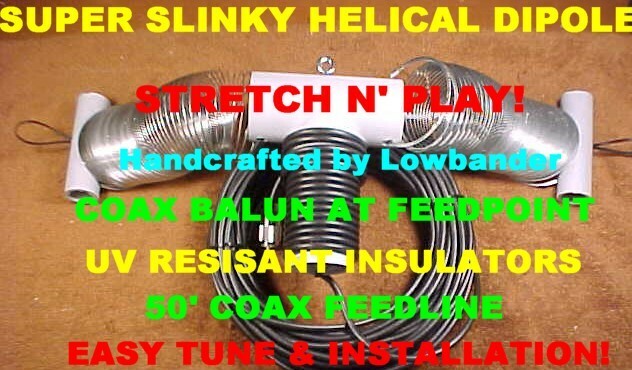 This antenna is different from other dipoles sold on Ebay in that the Super Helical Dipole is designed for situations with limited space and comes with a 25 foot COAX FEEDLINE! It offers flexibility and ease of installation that can be changed easily to fit your location. Changing the direction and length of the antenna by stretching it out more can in a sense "tune" the antenna! THIS ALLOWS ALL BAND OPERATION! With changing conditions and propagation on the bands this is a real plus! One of the most unique features of the Super Helical Dipole Antenna is the compact nature of the design. When done using, it can be returned to its original, tiny size, and packed away out of sight! Maybe you have a wife or a landlord who will not tolerate wires laying all over the place or hanging out your windows! If so, the Super Helical Dipole is a perfect fit for your location! 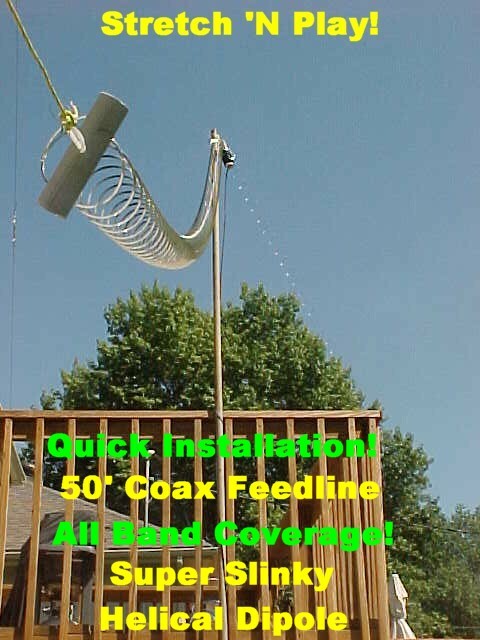 The Super Helical Shortwave Antenna can be configured in hundreds of ways and can be deployed to fit the unique situation at your home location. Here are just a few examples: SW listeners can deploy the Super Helical by stretching it out on the floor, hiding it behind furniture, attaching it to the baseboard of house or apartment, thumb tack it to the wall or ceiling, dropping it out the window vertically, stretching it out across the rafters in the attic, stretching it out the window to a nearby tree or pole and tying off the end!!! The instructions sheets offer numerous ways the Super Helical Dipole Antenna can be used successfully. On the ham bands the Super Helical Dipole is great for travel or limited space situations. It can be used in a hotel or motel room. The Super Helical Dipole makes a great vacation antenna and beats trying to use the mobile antenna to make decent contacts. I have personally used this antenna while camping and it was a truly awesome antenna stretched out between convenient trees. The convenient eye hook in the center insulator makes it very easy to use as an inverted Vee configuration. It only takes one support rope or nylon cord when using the Inverted Vee installation. But, the only limitation is the user's imagination! In most cases it will make an awesome difference in the quality of your reception and transmission over a mobile or random length wire. *"Wow! Huge Reception Improvement From S2 to S9+! Great Antenna! Fast Ship! A++++"
*"Thanks for fast service. Antenna much better than my 45' random wire!" *"The Super Helical Dipole allowed me to operate 40 meters where before I didn't have space for a dipole. In less than half the space of a normal dipole I had a great match and it works good!" 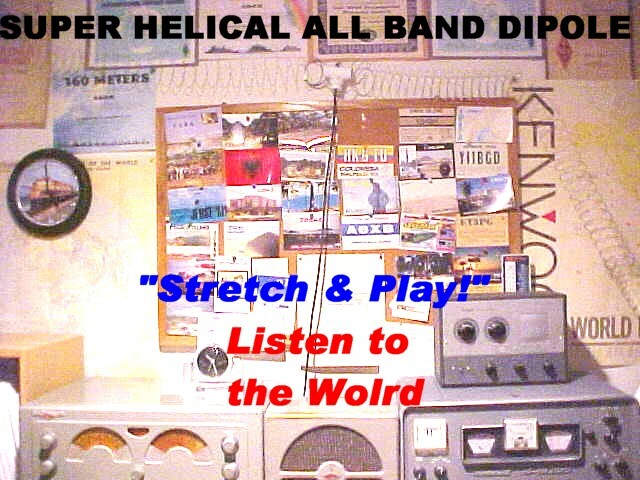 *"My radio club used the Super Helical Slinky Dipole I bought from you on Field Day this past June. It did a great job and we worked all over the USA. It was easy to adjust, even after a few cools ones!" *"It is really easy to adjust!" *"It is truly a plug and play! I stretched it out between 2 trees at the lake this weekend and I was on the air!" *"I stretched it out so ends were about 30' apart in an inverted V configuration and had a good match on 40 SSB band. " *"I just used the ATU in my transceiver and it allowed all band use without even adjusting it. Works better than my vertical." *"I recommend using the Inverted Vee arrangement of the Super Helical Dipole. It is so easy to adjust the ends from the ground to get a good match." *"Sure appreciate the fast shipping. I bought it on Friday and by Monday night it was up and working. Priority Mail is best mode of shipping." The Super Helical Dipole Antenna has over 60' of high quality coiled steel wire in each half of the dipole, for a total of 120 feet which gives users a huge signal capture area for radio signals when receiving! The length can be adjusted so that it will be a good match for any amateur band from 80-10 Meters. A small antenna tuner will allow all band operation without any hassle and could even offer some gain on the higher bands. The only power limitation for the Super Helical Dipole is the RG-58 coax, which of course, can easily handle 200-300 watts! The coax feed line, which is SOLDERED to each half of the Slinky for the best electrical connection, doesnt rely on any rivets or mechanical spacers, which often fail over time, to maintain electrical contact! Every joint is SOLDERED! This means years of reliable service. The Super Helical offers these important advantages over other popular antennas: 1) This antenna can be used on a multitude of shortwave and ham bands, because the length of the antenna can be adjusted so easily, 2) The antenna direction and length are easily adjusted to fit conditions, 3) The compact nature of the antenna gives users with limited space a real chance to hear signals on the bands! It can be returned to its original small size in seconds and stored away when not in use! 4)The antenna is a No hassle, Easy to Use, and truly Plug and Play. Look at the pictures to see how small, compact and easy to use this antenna really is! If you can't put up a permanent outside antenna, you should give very serious consideration to the Super Helical All Band Dipole!! If you can install an antenna outside, but have limited space, take at the photo showing the Super Helical Dipole installed outside. One is shown along the side of the house. This is a simple but effective method to install the antenna. A Huge capture area results in such an installation as this! The other photo showing the installation hung from my back deck is another practical arrangement. The center is attached at about 15' and the ends are stretched out and tied off to any convenient object like a fence. The Super Helical Dipole performed great in this arrangement and I was able to work all the USA on 40 Meters with this set up running my barefoot transceiver! But this is only one type of set up. One customer hung his Super Helical Dipole from his chimney and claimed it outperformed his $300 commercial vertical! Your imagination is the only limitation for installations! Why pay so much more for similar commercial antennas ?? All antennas are shipped via Priority Mail which means 2-3 day delivery time!